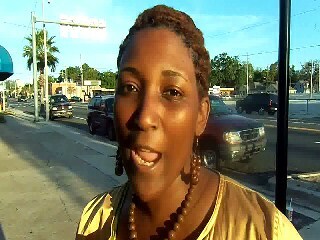 LanceScurv TV - LaShonda Dunlap's Bangin' Hairstyle! LanceScurv TV – LaShonda Dunlap’s Bangin’ Hairstyle! After wrapping up the shooting of a promotional video for the Hair In Motion Of New York beauty salon located in Orlando Florida for lifetime friend and owner Lesline, LanceScurv realizes that he wasn’t as incognito as he would like to think as he was spotted by Facebook friend LaShonda Dunlap who is a regular listener to the LanceScurv Talk Show. LaShonda was sporting a fresh hairstyle and was so overjoyed that she finally got the work completed that no one else seemed to be able to accomplish! You never know who your Facebook friends are and it pays to treat everyone right because imagine what a disaster it would have been if LanceScurv was one to be obnoxious and rude? It was all love and while watching this footage it reminded me that we as a people do not have enough of those moments where we just show plain old love for one another like we used to back in the day just because! Next : Gentlemen: Know That A Woman Scorned Can Never Stop The Glorious Parting Of Your Personal Red Sea!